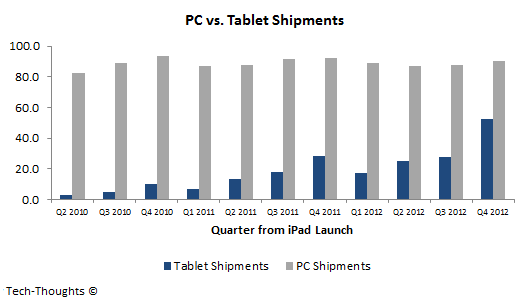 When Will Tablet Shipments Overtake PCs? I have previously written about the similarities between the evolution of the smartphone and tablet markets. These similarities aren't just limited to the evolution of leading platforms, but can also be used to predict the disruptive impact of new technology paradigms on existing markets. 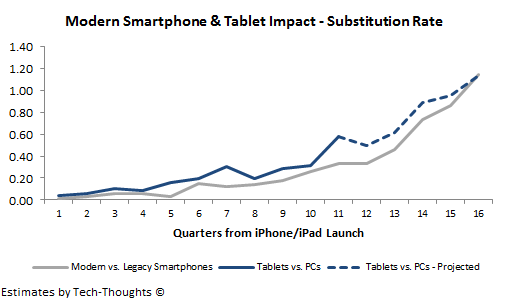 Let's use the evolution of the smartphone industry to predict the impact of tablets on PC shipments. It is important to understand that ever since the iPhone and Android were launched, the market was segmented into legacy smartphone platforms (Blackberry, Symbian & Windows Mobile) and modern smartphone platforms (iOS, Android & Windows Phone). We can say this with a certain degree of confidence, as consumers upgrading their smartphones would almost always move from a "legacy" platform to a "modern" platform. Platform shifts, after this change, were almost always within "modern" platforms. As we can see, while legacy smartphones continued to grow after the iPhone launch, modern smartphones grew at a much faster pace. 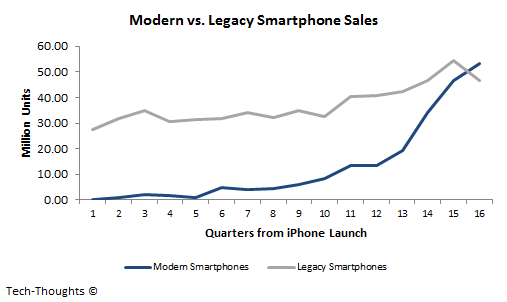 Legacy smartphones finally registered a drop in sales once modern platforms had attained parity. This was because global smartphone penetration was still a paltry 11% when the iPhone was launched. As a result, both legacy and modern smartphones diffused into the market, but at vastly different rates. Even though the overall market was growing, the growth of modern platforms shows that legacy smartphone purchases were increasingly being substituted by modern smartphone purchases. It is this "substitution rate" that holds the key to predicting technology dominance. As the chart clearly shows, the substitution rate patterns between the two markets are remarkably similar, showing a correlation of nearly 93% over the first 11 quarters. It is also interesting to note that tablet/PC substitution seems to be happening at a faster pace - This is function of high PC penetration and the impact of smartphone penetration on tablet adoption. Taking historical data and cyclicality into account, I've projected the tablet/PC substitution rate for the next year. In order to be conservative, I've assumed that the deviation between the two patterns will narrow over this period. Unlike the early days of the smartphone market, the PC market is fairly saturated. As a result, the average growth in combined shipments of tablets and PCs is likely to remain in the low-single digits - of course, cyclicality in demand in likely to have an impact, which I have taken into account. 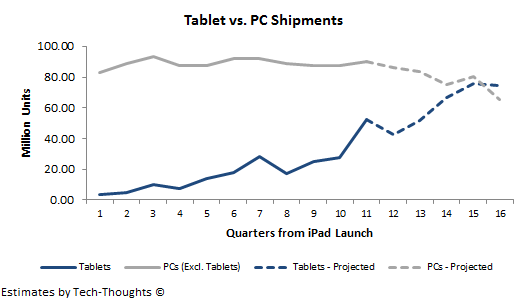 As per these estimates, quarterly shipments of tablets are likely to overtake those of PCs by Q1 2014. However, a more balanced substitution rate projection shows this change of guard happening earlier, in Q4 2013, when tablet shipments reach 75-80 million units. This shift is likely to be driven by quicker adoption of high quality, cost-effective tablets in emerging markets and the resulting impact on PC replacement rates. "However, a more balanced substitution rate projection shows this change of guard happening earlier, in Q4 2013, when tablet shipments reach 75-80 million units. This shift is likely to be driven by quicker adoption of high quality, cost-effective tablets in emerging markets and the resulting impact on PC replacement rates." I agree. I always thought that tablets will replace PCs sooner than when everybody thought they would.